In spite of the first resistances from a paternalist vision and the form of criminal thought that for many years treated children and adolescents as incapacitated, these aspects have been overcome, and it is hoped that respect for their human and procedural rights prevails, as well as their reintegration into society. 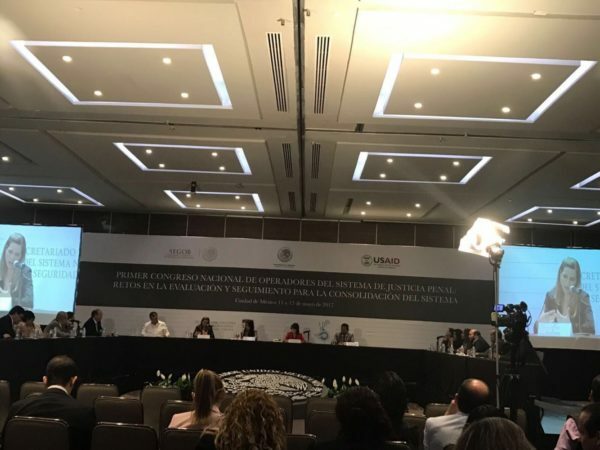 The President of the Supreme Court of Justice of the State of Yucatán (TSJEY), Santiago Altamirano Escalante, expressed this at the First National Congress of System Operators held on May 11 and 12 in Mexico City. Representatives of various institutions that implement the penal system in the country took part. Altamirano Escalante stated that Article 18 of the Constitution itself speaks about the obligation that must prevail through this system by means of which will be guaranteed the human rights that the Constitution recognizes for every person, as well as those specific rights according to their status as persons in development. He pointed out that the criterion that prevailed to open up our specific rules was that of progressivity, looking to maximize the rights of minors, finding a basis in Article 40 of the Convention on the Rights of the Child, which also speaks of the importance of their reintegration when they commit an act that the law indicates as a crime. It is not possible, continued the magistrate, to leave aside the fact that for a long time children and adolescents were stigmatized as incapable and with diminished capacities, brought to the point of being considered in some moments “Person Projects”. It is clear that this historical segment, which brought us to the present day with two criminal and one non-criminal reactions, the first two are the Oral Model for Adults from the age of 18 years, and Oral Model specialized for Adolescents aged 12 years old and less than 18, and the second, not criminal, that will be responsible for children under 12 who will only be provided social assistance through a procedure of protection and restitution of rights.